Enjoy this recipe for Gluten Free Dairy Free Berry Donut Holes. The Secret Recipe Club is such a wonderful way to find new blogs and recipes to enjoy. I love it! This time my assignment was Heather of Fit Mama, Real Food. Heather is a new mama, fitness professional, hopeful organizer, DIY-er, budgeteer of the house and recipe developer. Sounds like my kid of gal, huh? 🙂 On her blog she posts her favorite healthy real food recipes with simple how-to guides and meal tips. I was leaning toward her Sausage and Sorrel Quiche (with freezer instructions! Woo-hoo!) or the Green Orange Mango Banana Smoothie (a green smoothie with mangos? Nom-nom-nom!). But, as I was poking around trying to decide what to pick, I was thrilled to see a recipe that was already gluten and dairy free on her blog. How fun is that? AND it looked super scrumptious, so there you go… It was baked up in a donut pan, which I do have (to make mini donuts), but I recently purchased a Baby Cakes Cake Pop Baker, I decided to try donut holes. Because a thicker batter works best in a cake pop baker, the dough was a perfect texture to make perfect fluffy rounds. I drizzled the final donut holes with a glaze made with powdered sugar (you can use organic, if preferred) with just enough lemon juice to create a drizzling consistency but they were delicious with or without the glaze. I really liked these Gluten Free Dairy Free Lemon Berry Donut Holes, and so did my family. They cooked up quickly in my cake pop baker which made it a fun, not-too-sugary treat to offer my family. Thanks, Heather! I will definitely be making these again. I’ll make these as is, with just the lemon (maybe with some poppy seeds tossed in), with different berries, or maybe with diced fresh peaches when they are in season. Mmmm-mmm-mmmm! I can’t wait! 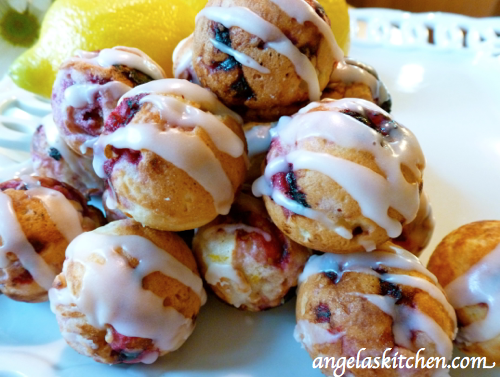 Printable recipe card for Gluten Free Dairy Free Lemon Berry Donut Holes. You'll never know these little bites of donut goodness are gluten free and dairy free. Try a different berry for variety. Preheat your oven to 350 degrees F. Plug in cake pop maker and heat according to manufacturer’s directions. In a bowl mix together the oat flour, brown rice flour, coconut flour, sugar, salt and baking powder. In another bowl, whisk together eggs, milk substitute, vanilla extract, oil, lemon zest, and applesauce. Mix wet into dry, until combined. Do not over stir. It will look slightly lumpy. Carefully fold the berries into the batter. Using a spoon or scoop, put about 1 tablespoon of batter into each depression of the cake pop baker. Close baker and cook for 4-5 minutes until donut holes are baked through. Remove donut holes to a cooling rack. When cool, drizzle with lemon glaze (powdered sugar with just enough lemon juice to get the consistency desired) or leave plain. the flavor of these sounds amazing, and they are cute to boot ! :) Love it! Yum!! Something about donuts that makes me feel like a kid again. These look absolutely amazing! What a fabulous gluten free treat! Recipes like these are so bad for me because I want to try to make them so bad, but would have to buy a donut (or cake pop) pan and I am SERIOUSLY maxed out on space in my kitchen right now. Grrrr! maybe you could just send me some ;) Be sure to stop by Seasonal Potluck this month to link up your pineapple or strawberry recipes http://bit.ly/KeYUr2 Or surf the collection to find some recipe inspiration! wow, beats the daylights out of Timbits - those look incredible. Right, which is why I specify on the corn allergen page to be sure your vanilla is corn free if you need that in this recipe. Not everyone who is gluten free needs to be corn free, also, but the info is GREAT for those that do! :) You can also purchase a completely grain free vanilla through http://www.vanillafromtahiti.com (allergen question answered at http://www.vanillafromtahiti.com/frequently-asked-questions-tahitian-vanilla-beans), and a gluten & corn free vanilla from http://www.meraby.com. I am sure there are more, those are just off the top of my head. Or simply split and scrape a vanilla bean for use - 2" of vanilla bean is equivalent to 1 tsp of vanilla extract. Be careful of potato vodka as some labeled as such may also contain corn or gluten product with the potatoes or be have cross contamination issues based on where/how it was made. See this handy guide to help narrow it down based on your level of sensitivity: http://celiacdisease.about.com/od/GlutenFreeAlcohol/a/Gluten-Free-Vodka-List.htm If you need to make one that is also alcohol-free see amy's post: http://simplysugarandglutenfree.com/homemade-sugar-free-alcohol-free-vanilla-extract/ Scroll through the comments to see info on corn. Hope this helps!